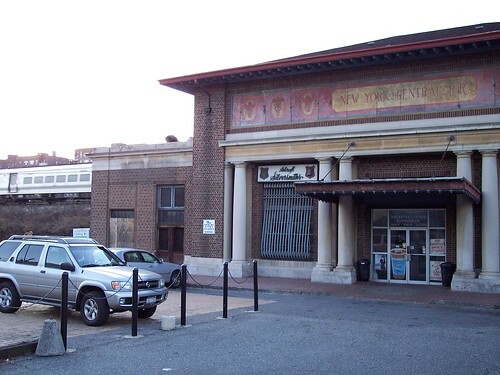 The grand old station building still stands, and still has New York Central RR painted on the front, but the building no longer serves as a station. New York Central simply called this station Mount Vernon, since the other Mount Vernon station now called Mount Vernon East was on the New York New Haven and Hartford. 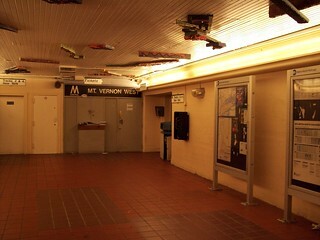 Although the old station building is no longer used by the railroad, there is a small waiting room and ticket office in the tunnel under the tracks. The sign above the ticket window must be pretty old, probably from the 1970s. The railroad hasn't been called M Central for many years. 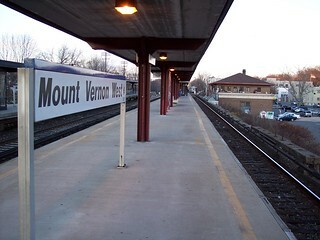 At track level, Mount Vernon West has the standard Metro-North modern high level platforms. There are two platforms serving the four tracks.